The Docklands Light Railway is an automated light metro or light rail system opened on 31 August 1987 to serve the redeveloped Docklands area of London. It covers several areas of London, reaching north to Stratford, south to Lewisham, west to Tower Gateway and Bank in the City of London financial district, and east to Beckton, London City Airport and Woolwich Arsenal. The DLR is operated under a concession awarded by Transport for London to Serco Docklands Ltd, a joint organisation of the former DLR management team and Serco Group. The system is owned by DLR Limited, part of the London Rail division of Transport for London (TfL) which also manages London Overground and London Tramlink (but not London Underground, which is a separate division of TfL). In 2006 the DLR carried over 60 million passengers. It has been extended several times, with work and proposals continuously ongoing. Although it has some similarities to other public transport systems in London such as the London Underground, DLR trains are not compatible with the Underground network, Crossrail or the wider railway network in Britain. The docks immediately east of London began to decline in the early 1960s as cargo became containerised. The opening of the Tilbury container docks, further east in Essex, rendered them redundant and in 1980 the British government gained control. The Jubilee line of the London Underground opened in 1979 from Stanmore to Charing Cross as the first stage of an intended cross-town tube line beyond Charing Cross to south-east London. Although land, as at Ludgate Circus and Lewisham, had been reserved for the second stage, the rising cost led to the project's indefinite postponement in the early 1980s. The London Docklands Development Corporation (LDDC), needing to provide public transport cheaply for the former docks area to stimulate regeneration, considered several proposals and chose a light-rail scheme using surviving dock railway infrastructure to link the West India Docks to Tower Hill and to run alongside the Great Eastern lines out of London to a northern terminus at Stratford station where a disused bay platform at the west of the station was available for interchanges with the Central Line and main lines. Stratford was preferred to a Mile End alternative, which would involve street running trams and was at variance with the concept of a fully automated railway. The growth brought to Docklands enabled the Jubilee Line to be extended in 1999 to east London by a more southerly route than originally proposed, through Surrey Quays/Docks, Canary Wharf and the Greenwich Peninsula (which was the next regeneration area) to Stratford. The contract for the initial system was awarded to G.E.C. Mowlem in 1984 and the system was constructed over three years from 1985 to 1987 at a cost of £77 million to complete. The line was opened to the public by Queen Elizabeth II on 30 July 1987. The first regular passenger services commenced on 31 August of that year. The initial system comprised two routes, one from Tower Gateway to Island Gardens and the other from Stratford to Island Gardens. Most of the track on these lines is elevated (either on disused railway viaducts or on newly built concrete viaducts) with some use of disused surface-level railway rights of way, although in the original plans for the DLR the lines were intended to be entirely above ground. The trains have always been fully automated and controlled by computer operations and normally have no driver; a Passenger Service Agent (PSA), originally referred to as a "Train Captain", on each train is responsible for patrolling the train, checking tickets, making announcements and controlling the doors. PSAs can also take control of the train in certain circumstances including equipment failure and emergencies. The system was lightweight, with stations designed for trains with a length of only a single articulated vehicle. The three branches totalled Template:Convert/mi of route, had 15 stations, and were connected by a flat triangular junction near Poplar. Services ran Tower Gateway-Island Gardens and Stratford-Island Gardens, so the north side of the junction was only used for trains to travel to and from the depot at Poplar, not in regular passenger service. The first stations were mostly of a common design and constructed from standard components. A characteristic of them was a relatively short half-cylindrical glazed blue canopy to provide shelter from the rain. All stations were above ground and were generally unstaffed (stations located below ground built during later extensions were required by law to be staffed, in case evacuation is needed). The initial system had little capacity as the Docklands area very quickly developed into a major financial centre and employment zone, increasing the demand on the fledgling commuter network. In particular Tower Gateway, at the edge of the City of London, attracted criticism for its poor connections. This is partly because the system was not expected by much of its management to achieve such high levels of usage. Plans were developed to extend to Bank and to Beckton before the system opened to the public. As a result all stations and trains were extended to two-unit length, and the system was taken into the heart of the City of London to Bank underground station through a tunnel which opened in 1991. This extension diverged from the initial western branch, leaving Tower Gateway station on a stub. The original trains, not suitable for use underground, became obsolete. (see the Rolling Stock section below, and the main article Docklands Light Railway rolling stock). As the Canary Wharf office complex grew, Canary Wharf DLR station was redeveloped from a small wayside station to a large one with six platforms serving three tracks, with a large overall roof and fully integrated into the malls below the office towers. The original DLR station was never completed and was dismantled before the line officially opened, although the automatically-operated trains continued to stop at its location. The areas in the east of Docklands needed better transport connections to encourage development and so a fourth branch was opened in 1994, from Poplar to Beckton via Canning Town transport interchange, running along the north side of the Royal Docks complex. Initially it was thought likely to be underutilised, due to sparse development. Several proposals were made for the Blackwall Area. As part of this extension, one side of the original flat triangular junction was replaced with a grade-separated junction west of Poplar, and a new grade-separated junction was built at the divergence of the Stratford and Beckton lines east of Poplar. Poplar station was rebuilt to give cross-platform interchange between the Stratford and Beckton lines. 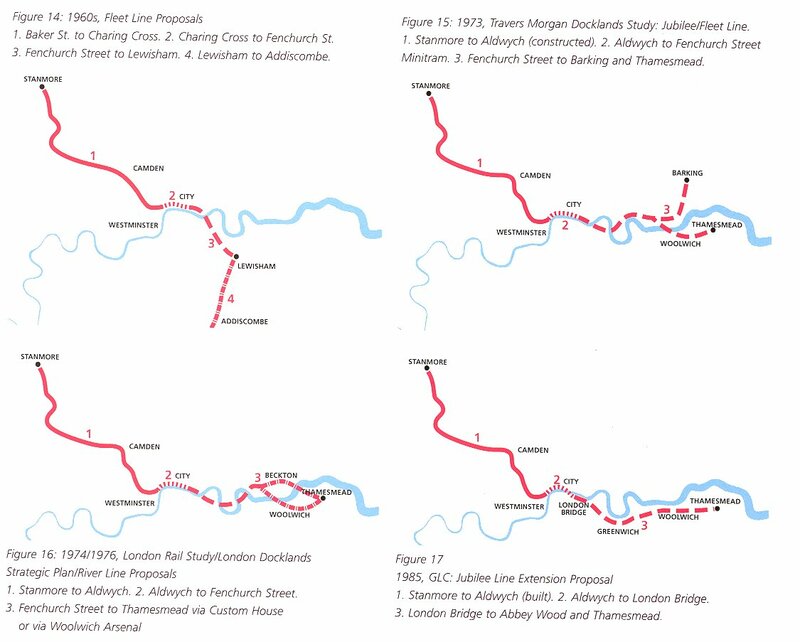 Early in the DLR operation, Lewisham London Borough Council commissioned a feasibility study into extending the DLR under the River Thames. This led the council to advocate an extension to Greenwich, Deptford and Lewisham. In its early days, the DLR had been criticised by experts as being "the wrong type of system for Docklands' needs", in comparison with the Underground line proposed in the 1980s. However, the ambitions of operators were supported by politicians in Parliament, including then Labour Deputy Prime Minster John Prescott and Lord Whitty, and by 1996 construction work on the line commenced as proposed. On 3 December 1999 the Lewisham extension opened to the public. It left the original Island Gardens route south of the Crossharbour turn-back sidings, dropped gently to Mudchute where a street-level station replaced the high-level one on the former London & Blackwall Railway viaduct and then entered a tunnel following the line of the viaduct and reached a new shallow subsurface station at Island Gardens, accessed by stairs. The line crossed under the Thames to a station in the centre of Greenwich and then surfaced at the main-line Greenwich station with cross-platform interchange between the northbound DLR track and the city-bound main line. Then the line snaked on a concrete viaduct to Deptford, Elverson Road station at street level, close to Lewisham town centre and terminated in two platforms between and below the main-line platforms at Lewisham railway station, which is near the town shopping centre, with bus services stopping directly outside the station. The Lewisham extension quickly proved profitable. The next series of developments of the DLR were aided by a five year programme of investment for public transportation across London that was unveiled by Mayor of London Ken Livingstone on 12 October 2004. On 2 December 2005, a new eastward branch, along the southern side of the Royal Docks complex, opened from Canning Town to King George V via London City Airport. A further extension from King George V to Woolwich Arsenal opened on 10 January 2009, with the terminal station built at or close to the planned future stop on the Crossrail line to Abbey Wood via West India and Royal Docks. Government approval for the project was given in February 2004, with a projected cost of £150 million, due to a required second DLR tunnel crossing of the River Thames, met by Private Finance Initiative funding. Construction began in June 2005, the same month that the contracts were finalised, and the tunnels were completed on 23 July 2007, and officially opened by Boris Johnson, Mayor of London on 12 January 2009. Following completion this project was shortlisted for the 2009 Prime Minister’s Better Public Building Award. The original Tower Gateway station was closed in mid-2008 for complete reconstruction. The two terminal tracks either side of a somewhat narrow island platform were replaced by a single track between two platforms, one for arriving passengers and the other for those departing. The station reopened on 2 March 2009. As part of an upgrade to the system to allow three-car trains, some strengthening work was necessary at the Delta Junction north of West India Quay. It was decided to include this in a plan for further grade-separation at this critical junction to eliminate the conflict between services to Stratford and from Bank. Following this, a new timetable has been introduced with improved frequencies in peak hours. The new grade-separated route from Bank to Canary Wharf is only used at peak times as it bypasses West India Quay station. Work on this project proceeded concurrently with the three-car upgrade work and the flyunder, and the improved timetable came into use on 24 August 2009. There is an additional shuttle service from Canning Town to Prince Regent, operated when exhibitions are in progress at the ExCeL exhibition centre, to double the normal service. These trains reverse direction in the eastbound platform at Canning Town and on a crossover at the high point where the line crosses the Connaught Crossing road bridge between Prince Regent and Royal Albert stations. At other stations trains reverse direction in the terminal platforms, except at Bank where there is a reversing headshunt beyond the station. Some peak hour trains on the Stratford line turn back at Crossharbour rather than continuing to Lewisham. There are also occasional trains from Tower Gateway to Crossharbour and Lewisham. Trains serve every station on the route with the exception of peak services from Westferry to Canary Wharf. These services are unable to call at West India Quay because they are routed along a different track to avoid junction conflicts. During the substantial long-term works for various DLR extension projects, a range of other routes may be operated at weekends, such as Beckton to Lewisham if the Bank branch is closed. The northern, southern and south-eastern branches terminate at the National Rail (main line) stations at Stratford, Lewisham and Woolwich Arsenal respectively. Other direct interchanges between the DLR and National Rail are at Limehouse and Greenwich. Most DLR stations are elevated, with others at street level, in a cutting, or underground. Access to the platforms is mostly by staircase and lift, although there are escalators at some stations. From the outset the network has been fully accessible to wheelchairs; much attention was paid to quick and effective accessibility for all passengers. The stations have high platforms, matching the floor height of the cars, allowing easy access for passengers with wheelchairs or pushchairs. Most stations are of a modular design dating back to the initial system, extended and improved over the years. This design has two side platforms, each with separate access from the street, and platform canopies with a distinctive rounded roof design. Stations are unstaffed, except the underground stations at Bank, Island Gardens, Cutty Sark and Woolwich Arsenal (for safety reasons), a few of the busier interchange stations and City Airport which has a manned ticket office to cater for passengers unfamiliar with the system. Canning Town, interchange with the Jubilee line, along with the exhibition centre stations at Custom House and Prince Regent, are normally staffed on the platform whenever there is any significant exhibition at the ExCeL exhibition centre. During the recent engineering works which have closed the Bank branch, additional staff were present at Tower Gateway to ensure the larger numbers of passengers using the station were able to board/exit trains safely. On 3 July 2007, DLR officially launched an art programme called DLR Art, similar to that on the London Underground, Art on the Underground. Alan Williams was appointed to produce the first temporary commission, called "Sidetrack", which portrays the ordinary and extraordinary sights often unfamiliar to passengers, on the system and was displayed throughout the network. Ticketing on the DLR is part of the London fare zone system, and Travelcards that cover the correct zones are valid. There are one-day and season DLR-only "Rover" tickets available, plus a one-day DLR "Rail and River Rover" ticket for use on the DLR and on City Cruises river boats. Oyster Pre-Pay is also available; passengers need to both touch in and touch out on the platform readers or pass through the automatic gates. Tickets must be purchased from ticket machines at the entrance to the platforms, and are required before the passenger enters the platform. There are no ticket barriers in DLR-only stations, and correct ticketing is enforced by on-train checks by the PSA. There are barriers at Bank, Canning Town, Woolwich Arsenal and Stratford, where the DLR platforms are within the barrier lines of a London Underground or National Rail station. Although Oyster cards are TfL's preferred method of ticketing on the DLR, there are some differences in the implementation compared to the Underground. Stations are simplistic and most do not have ticket gates. There have been criticisms that the Oyster touch in/out units are not readily apparent, particularly to infrequent passengers, as they have been sited where there is an electrical supply, which may not be the most obvious point for users. London City Airport station, which is used by many travellers from overseas, is a particular example of this. The DLR is now used by up to 100,000 people every day. Within a year of launch, annual passenger numbers were 17 million. By 2009 this had increased to 64 million While the first five years were plagued with unreliability and operational problems, the system has now become highly reliable. In 2008 87% of the population of North Woolwich were in favour of the DLR. The Parliamentary Transport Select Committee has reviewed light rail Due to the success of the DLR, proposals for systems elsewhere have emerged. The North and West London Light Railway is one such plan for an orbital railway serving the other side of London. The Docklands Light Railway has been successful, as with other light rail systems built in the last years. However, the DLR has been criticised as having been designed with insufficient capacity to meet the demand that quickly arose. The level of demand was underestimated. In 1989 such criticism was aimed at GEC, a major contractor for the DLR construction. There remains debate in the UK as to whether light rail is cost effective, with criticism focused on alleged low ridership and cost overruns. Although DLR claims to be highly accessible, only folding bikes are allowed on trains. One incident involved a station manager refusing to allow a train to leave before several triathlon competitors had to leave the vehicle. DLR say this is because if evacuation of a train is required, they would slow down the process. DLR cars are not designed with bicycles in mind - if they were allowed, they might obstruct doors and emergency exits. The DLR is operated by high-floor, bi-directional, single-articulated electrical multiple unit cars. Each car has four doors on each side, and two or three cars make up each train. There are no driver's cabs because normal operations are automated. Instead, the cars have a small driver's console (concealed behind a locked panel at each car end) from which the PSA (Passenger Service Agent) can drive the car. Consoles at each door opening allow the PSA to control door closure and make announcements whilst patrolling the train. Because of the absence of a driver's position, the fully-glazed car ends provide an unusual forward (or rear) view for passengers. The current stock has a top speed of Template:Convert/LoffAoffDbSoff. Despite having high floors and being highly automated, the cars are derived from a German light-rail design intended for use in systems with street running. All the cars that have operated on the system to date look similar, but there have been several different types, some still in service and others sold to other operators. New units (B2007) for the Docklands Light Railway were purchased from Bombardier in 2005 and delivered between 2007 and 2010. There are two operating depots, at Poplar and Beckton, where rolling stock is kept. Both are furnished with maintenance workshops and extensive open-air carriage sidings. The Poplar depot, which is also the operating headquarters of DLR Limited and Serco Docklands, is based alongside the north side of the Stratford line east of the station, while the Beckton depot is to the east of the line on a long spur north-east of Gallions Reach station. Several diesel locomotives used for track maintenance tasks are also stored at Poplar. Between 2005-2006 Beckton depot received extensions and upgrades including more sidings and improved signalling. Originally the DLR used signalling based on a fixed-block technology developed by GEC-General Signal and General Railway Signal. This was replaced in 1994 with a moving-block TBTC (Transmission Based Train Control) system developed by Alcatel, called SelTrac. The SelTrac system was bought by Thales in 2007 and current updates are being provided by Thales Rail Signalling Solutions. The same technology is used for some other rapid transit systems, including Vancouver's SkyTrain, Toronto's SRT, San Francisco's Municipal Railway (MUNI) and Hong Kong's MTR, the SelTrac S40 system is currently being adopted by the Jubilee line and Northern line on London Underground. Transmissions occur via an inductive loop cable between each train's Vehicle On-Board Controller (VOBC) and the control centre (VCC, SMC) at Poplar. If this link is broken i.e. communication is lost between the VOBC and VCC, SMC, the train emergency brakes and stops until it is authorised to move again. If the whole system fails the train can run in restricted manual at only Template:Convert/LoffAoffDbSoff for safety until the system is restored and communication is re-established. Emergency brakes can be applied if the train breaks the speed limit during manual control or overshoots a fixed stopping point, or if the train leaves the station when the route has not been set. With the development of the eastern Docklands as part of the Thames Gateway initiative and London’s successful bid for the 2012 Summer Olympics, several extensions and enhancements are under construction, being planned or being discussed. The capacity of the entire system is being increased by upgrading it to take three-car trains. The alternative of more frequent trains was rejected as the signalling changes needed would have cost no less than upgrading to longer trains and with fewer benefits. The railway was originally built for single-car operation, and the upgrade requires both strengthening viaducts to take the heavier longer trains and lengthening many platforms; however recent extensions were already built to take three-car trains. It has been suggested that the extra capacity will be useful during the 2012 Summer Olympics, which are expected to increase the usage of London's transport network. The main contractor selected to carry out the expansion and alteration works on the DLR network was Taylor Woodrow. A few stations (Elverson Road, Pudding Mill Lane (one platform Stratford Bound), Royal Albert, Gallions Reach, Cutty Sark) have not been extended to accept three-car trains; such extension may be impossible in some cases. Selective Door Operation will be used, with emergency walkways in case a door fails to remain shut. For instance Cutty Sark station is underground, and both costs and the risk to nearby historic buildings prevent platform extension. The tunnel there was built with an emergency walkway throughout its length. Additional work beyond that needed to take the three-car trains has been carried out at some stations. This included replacing canopies with more substantial ones along the full platform length. A new South Quay station has been built Template:Convert/m to the east of the former location as nearby curves precluded lengthening. Mudchute now has a third platform and all its platforms have full-length canopies. Tower Gateway was closed until March 2009 and re-opened as a single track three-car terminus with two platforms - one side for boarding and the other for alighting. For this upgrade DLR purchased an additional 31 cars compatible with existing rolling stock to meet the demand for more train units. The works were originally planned as three separate phases: Bank-Lewisham, Poplar-Stratford, and finally the Beckton branch. The original £200m works contract was awarded on 3 May 2007. Work started in 2007 and the Bank-Lewisham phase was originally due to be completed in 2009. However, the work programme for the first two phases was merged and the infrastructure work was completed by the end of January 2010. The busy Lewisham-Bank route now exclusively runs three-car trains on Mondays-Fridays. Other routes will run the longer trains when demand builds up to require it. Funding to upgrade the Beckton branch was not secured until December 2008, and the work will not be completed until early 2011. The only stations which still require upgrading are Beckton, Prince Regent and Custom House for ExCel. An extension to Stratford International station taking over that part of the North London Line from Canning Town to Stratford, will link the Docklands area with domestic and international high-speed services on High Speed 1. It is an important part of transport improvements for the 2012 Olympic Games, much of which will be held on a site adjoining Stratford International. The first contract for construction work was awarded on 10 January 2007 and construction work started in mid 2007. Originally scheduled to open in mid 2010, it is currently planned to open in February 2011. Bolded stations are former North London Line stations. From Canning Town to Stratford low level, the Stratford International extension will share its right-of-way with the Jubilee Line of the London Underground. Although the two systems will share the same right-of-way, Jubilee Line trains will not have stations at Star Lane, Abbey Road and Stratford High Street. At Stratford, new platforms have been built for the North London Line, leaving its original platforms (1 and 2) and moving to a separate location at the northern end of the station. The old platforms are available for the DLR and will be renumbered platforms 16 and 17, adjacent to the Jubilee Line platforms. Interchange between the two DLR routes will be possible, although their platforms are widely separated and at different levels. There will be no track connection between the two routes. As part of the Transport & Works Act (TWA) application, Royal Victoria station on the Beckton branch will be extended to accommodate three-car trains, with a siding to enable trains to reverse there, using land released by the closure of this section of the parallel North London line. A partly grade-separated junction built south of Canning Town will prevent conflicting movements on the existing Bank branch and the new Stratford branch going to and from the Beckton route and the Woolwich Arsenal route. When Crossrail is built, one of its tunnel portals will be on the current site of Pudding Mill Lane station. The DLR will be diverted between City Mill River and the River Lea onto a new viaduct to be built further south, including a replacement station. The opportunity may be taken to eliminate the only significant section of single track on the system, between Bow Church and Stratford, although there is no provision for works beyond the realigned section in the Crossrail Act. Crossrail will interchange with the DLR at Custom House, at Stratford and at West India Quay with Crossrail's Canary Wharf station. Custom House will be completely rebuilt. If a Crossrail station is built in the London City Airport area, a new DLR station could be built alongside (see Connaught Road/Silvertown Interchange station section below). This proposed extension from Gallions Reach to Dagenham Dock via the riverside at Barking would connect the Barking Reach area, a formerly industrial area now due to be a major redevelopment as part of the London Riverside, with the Docklands. It would cover major developments at Creekmouth, Barking Riverside, Dagenham Dock Opportunity Area, and five stations are planned, at Beckton Riverside station, Creekmouth, Barking Riverside, Goresbrook (formerly Dagenham Vale) and Dagenham Dock. The extension is key if English Partnerships' plan is to work. As shown in DLR's first consultation leaflet, there are proposals for the DLR to extend further than Dagenham Dock, possibly to Dagenham Heathway or Rainham. Construction was not expected to start until 2013 and the earliest expected completion date was 2017. However the Financial crisis of 2007–2010 meant that TfL requested a delay to the public enquiry whilst funding was clarified. Given that the purpose of the extension was to serve as-yet unbuilt homes it became very difficult to predict timescales for this project. The project has been reported to have been cancelled by the Mayor of London Boris Johnson as a cost cutting measure, although there have been calls for this to be reconsidered, the extension being regarded by Barking and Dagenham council as essential to regenerating the area. As of October 2009, the plan seems to be once again under consideration. The Mayor's Transport Strategy states that the Mayor, through Transport for London, will investigate the feasibility of the extension to Dagenham Dock as part of the housing proposals for Barking Riverside. This station had been included as potential future development on the London City Airport extension since it was first planned. It would be between Canning Town and West Silvertown, due west of the western end of Royal Victoria Dock. Since the station's intended purpose is to serve the surrounding area (currently a mix of brownfield and run-down industrial sites) when it is regenerated, the development is indefinitely on hold due to the area being safeguarded for the Silvertown Link, a new Thames river crossing that has been proposed but currently has no timetable for implementation. A site near to London City Airport has been identified as a possible additional station on the London City Airport extension. It would be a possible interchange with Crossrail between London City Airport and Pontoon Dock. However, no plans have emerged as to when this station is to be planned and built. The original extension was designed to allow a station to be built here. It may be located south of the Connaught Crossing. In February 2006 a proposal to extend the DLR to Charing Cross station from Bank DLR branch was revealed. The idea, originating from a DLR "Horizon Study", is at a very early stage at the moment, but would involve extending the line from Bank in bored tunnels under Central London to the Charing Cross Jubilee Line platforms, which would be brought back to public use. These platforms are now on a spur off the current Jubilee line and are not used by passenger trains. It has since been revealed that a proposed route as far as Victoria station will be investigated. While not confirmed it is probable that the scheme would also use the existing overrun tunnels between the Charing Cross Jubilee platforms and a location slightly to the west of Aldwych. These tunnels were intended to be incorporated into the abandoned Phase 2 of the Fleet Line (Phase 1 became the original Jubilee Line, prior to the Jubilee Line Extension). However they would need some enlargement because DLR gauge is larger than tube gauge and current safety regulations would require an emergency walkway to be provided in the tunnel. Two reasons driving the proposal are capacity problems at Bank, having basically one interchange between the DLR and the central portion of Underground, and the difficult journeys faced by passengers from Kent and South Coast between their rail termini and the DLR. Intermediate stations would be at Ludgate Circus and Aldwych, which was intended for future connection with the proposed but now abandoned Cross River Tram. During the last Horizon study, a possible extension was considered from Bank towards Euston or London King's Cross. The main benefit of such an extension would be to broaden the available direct transport links to the Canary Wharf site. It would create a new artery in central London and help relieve the Northern and Circle lines. There are no official plans for possible stations except towards Farringdon, possibly using some of the disused Thameslink infrastructure. This extension was looked at during the latest Horizon Study. The route would follow the Southeastern line and terminate between Catford station and Catford Bridge station. It has been seen as attractive to the district, as has the current terminus at Lewisham which was built in an earlier extension. However, early plans showed problems due to Lewisham DLR station being only marginally lower than the busy A20 road which impedes any proposed extension. The plan is however being revised. When the Lewisham extension was first completed there were proposals to continue further to Beckenham to link it up with the Tramlink system. However, the way in which Lewisham DLR was built impedes this possible extension and it would prove costly to redevelop. On 10 March 1987, before the railway opened, a test train crashed through station buffer stops at the original high-level terminus Island Gardens station and was left hanging from the end of the elevated track. The accident was caused by unauthorised tests being run before accident-preventing modifications had been installed. The train was being driven manually at the time. On 22 April 1991, two trains collided at a junction on the West India Quay bridge during morning rush hour, requiring a shutdown of the entire system and evacuation of the involved passengers by ladder. One of the two trains was travelling automatically, operating without a driver, while the other was under manual control. On 9 February 1996, the Provisional Irish Republican Army blew up a lorry under a bridge near South Quay, killing two people and injuring many others. This number would have been higher if not for advance warning. The blast did £85 million damage and marked an end to the IRA ceasefire. Significant disruption was caused to DLR services, and a train was left stranded at Island Gardens station, unable to move until the track was rebuilt. ↑ Cross, David (1 September 1987). "Enthusiasts flock to busy opening day: Docklands Light Railway". The Times. Retrieved on 17 August 2009. ↑ Clive's Underground Line Guides: Jubilee Line. Clive's UndergrounD Line Guides. Retrieved on 26 June 2009. ↑ Various route options for the London Underground dating from the 1960s to 1980s. London Docklands Development Corporation. Retrieved on 17 April 2007. ↑ The key to Docklands accessibility- a public transport spine. London Docklands Development Corporation. Retrieved on 25 June 2009. ↑ Transport: Being there. New Civil Engineer. Retrieved on 25 June 2009. ↑ 8.0 8.1 8.2 8.3 Docklands Light Railway (D.L.R.) - Exploring 20th Century London. Exploring 20th Century London. Retrieved on 3 September 2009. ↑ 9.0 9.1 Jolly, Stephen; Bayman, Bob (November 1986). Docklands Light Railway Official Handbook. Harrow Weald: Capital Transport Publishing. ISBN 0 904711 80 3. ↑ Technology: Signalling & Control. Transport for London. Retrieved on 29 August 2007. ↑ The Docklands Light Railway, London, UK. BBC - h2g2. Retrieved on 29 August 2007. ↑ 13.0 13.1 Docklands Light Railway Extensions, London, United Kingdom. Railway-Technology.com. Retrieved on 9 July 2008. ↑ 15.0 15.1 New Games transport link marks 20 years of progress. London 2012 Official Blog (13 January 2009). Archived from the original on 3 January 2013. Retrieved on 24 June 2009. ↑ Hansard (6 May 1987). ↑ 18.0 18.1 18.2 DLR history timeline TfL official site'.' Retrieved 3 September 2007. ↑ Options for the DLR Beckton Extension route. Retrieved on 23 February 2008. ↑ Getting Back On The Right Track. The Bolton News. Retrieved on 25 June 2009. ↑ DLR helps Mowlem ride high at £25 million. highbeam.com. Archived from the original on 3 January 2013. Retrieved on 25 June 2009. ↑ An extension to the DLR is being built between King George V and Woolwich Arsenal. Another extension is planned from Canning Town to Stratford International.. Railway-Technology.com. Retrieved on 9 July 2008. ↑ DLR extension award. Construction News (10 June 2009). Retrieved on 24 June 2009. ↑ Docklands Light Railway - West India Quay/Poplar Junction Improvements. Transport for London. Retrieved on 1 August 2009. ↑ 38.0 38.1 38.2 History. Transport for London. Retrieved on 9 July 2008. ↑ Docklands Light Railway. DLR Art. Retrieved on 2010-08-05. ↑ London jetpack: London Oyster travelcard. studentjetpacks.com. Retrieved on 21 June 2009. ↑ 45.0 45.1 Docklands Light Railway (DLR) boasts an impressive operational record. Transport for London. Retrieved on 24 June 2009. ↑ 46.0 46.1 DLR: resolving the problems. The LDDC History Pages. Retrieved on 11 July 2008. ↑ North Woolwich Research: Changes, 2006–2008 - The influence of Docklands Light Railway. lcacc.org. Retrieved on 26 June 2009. ↑ Horses for Courses: The Advantages of Light Rail. Transport Select Committee. Parliament - House of Commons (3 April 2005). ↑ Light Rail – the Solution to Inner-City Chaos?. Railway Technology. Retrieved on 26 June 2009. ↑ GEC escape criticism over London's Docklands Light Railway. cbronline.com (8 June 2007). Retrieved on 26 June 2009. ↑ DLR bans Triathlon cyclists. thisislondon.co.uk (8 June 2007). Retrieved on 26 June 2009. ↑ DLR Depot Gets £7.7m Revamp. railwaypeople.com (13 October 2005). Retrieved on 21 June 2009. ↑ Docklands Light Railway - Development Projects. Transport for London. Retrieved on 9 July 2008. ↑ Docklands Light Railway - Three-carriage Capacity Enhancement Project. Transport for London. Retrieved on 9 July 2008. ↑ Docklands Light Railway (DLR) 3 Car Enhancements Project. Arup. Retrieved on 24 June 2009. ↑ Taylor Woodrow wins £200m Docklands Light Railway project. Contract Journal. Retrieved on 24 June 2009. ↑ Mudchute third platform. London Connections (11 April 2008). Retrieved on 29 June 2008. ↑ £20m bullet trains to serve Olympic Park. London2012.org (28 September 2004). Retrieved on 6 July 2005. ↑ 25/10/2006 Government gives green light to key 2012 rail link. TfL. ↑ Managing Director's Report - London Rail item 5.4. TfL (11 November 2011). Retrieved on 10 November 2010. ↑ 71.0 71.1 Ian Allan Publishing. Modern Railways. March 2006. ↑ Crossrail. AlwaysTouchOut.com (20 February 2008). Retrieved on 9 July 2008. ↑ DLR Barking Riverside consultation document (PDF). Transport for London. Archived from the original on 1 December 2007. Retrieved on 23 February 2008. ↑ TfL Board meeting papers February 2008 (PDF). Retrieved on 13 February 2008. ↑ Go-ahead for our new future. Barking and Dagenham Post. Retrieved on 24 June 2009. ↑ Dagenham prison plan under attack. London Evening Standard. Retrieved on 24 June 2009. ↑ Doubts over future DLR extension. BBC News. Retrieved on 26 June 2009. ↑ Mayor's Transport Strategy, Chapter five—transport proposals. Transport for London. Retrieved on 21 October 2009. ↑ DLR to City Airport. AlwaysTouchOut.com. Retrieved on 9 July 2008. ↑ DLR Victoria extension - official. District Dave's London Underground Site (23 October 2008). Retrieved on 10 January 2009. ↑ DLR to Catford. Always Touch Out (27 October 2007). Retrieved on 9 July 2008. ↑ Tumposky, Ellen (10 February 1996). Blast shatters London, Adams Presumes IRA's Responsible. NYDailyNews.com. Retrieved on 12 November 2008. Jolly, Stephen; Bayman, Bob (November 1986). Docklands Light Railway Official Handbook. Harrow Weald: Capital Transport Publishing. ISBN 0 904711 80 3. Gonsalves, B.F.; R.W. Deacon, D. Pilgrim, B.P. Pritchard (1991). Docklands Light Railway and Subsequent Upgrading. Proceedings of the Institution of Civil Engineers. UK Transport Wiki is a FANDOM Lifestyle Community.